Use the form below to inquire about Heritage Fort Resort Stay At Rohat . Use the form below to reserve for Heritage Fort Resort Stay At Rohat . Air Conditioned Room, Free Wi-fi Internet Access, Hair dryer, Hot and Cold Running Water, Mini bar, Private Balcony/Verandah, Private Swimming Pool, Room Service, Tea/Coffee Maker, TV with cable connection in each rooms. Air Conditioned Room, Free Wi-fi Internet Access, Hair dryer, Hot and Cold Running Water, Jacuzzi, Private Balcony/Verandah, Room Service, Tea/Coffee Maker, TV with cable connection in each rooms. This modern Fort welcomes travelers king size with its unique experiences, unparalleled hospitality, and palatial accommodations. 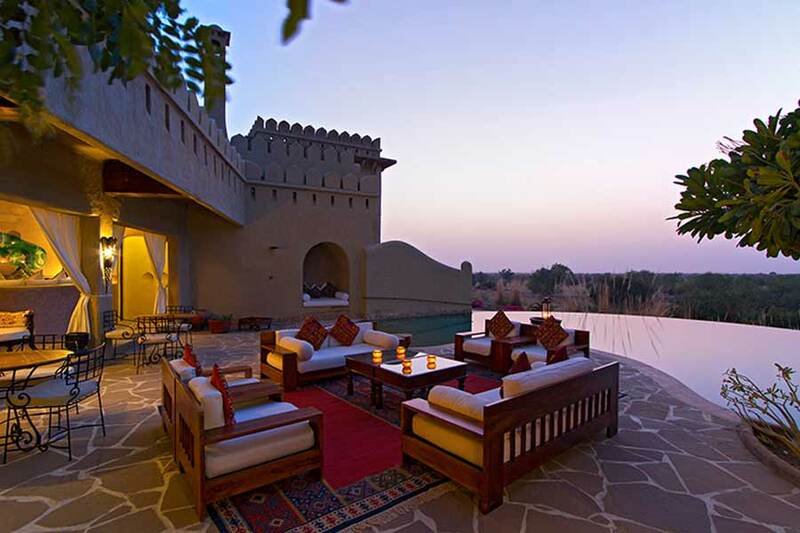 This Heritage Fort Resort stay at Rohat is an ambassador of Rajasthan’s rich heritage and culture. More than a hundred carpenters, craftsmen, and artisans from around the Marwar region toiled for about two years to construct this masterpiece. 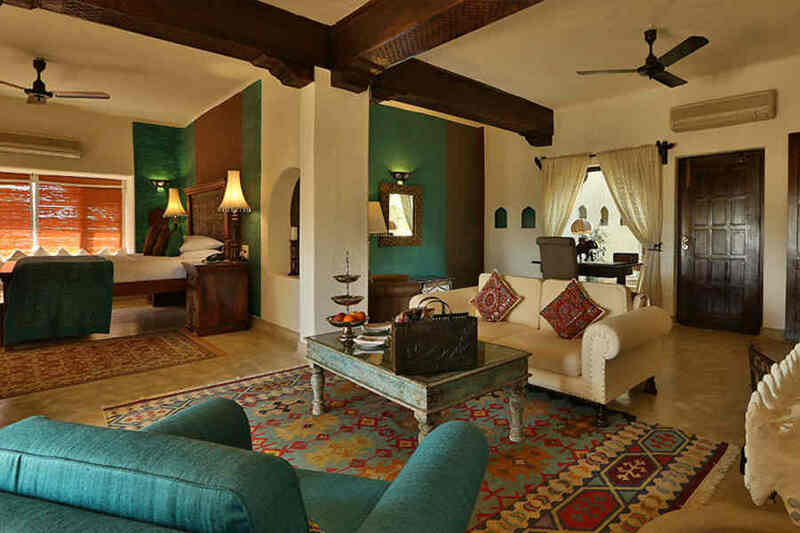 This Heritage Fort Resort Stay at Rohat contains nine glorious suites, each measuring more than 1,700 sq ft in size. The suites on the ground floor have their very own courtyard and personal plunge pool on the deck. 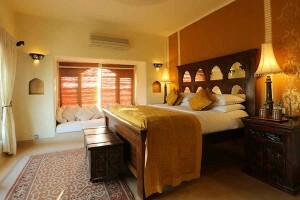 The suites on the first floor have an open air Jacuzzi each on the private terrace for pure relaxation and indulgence. 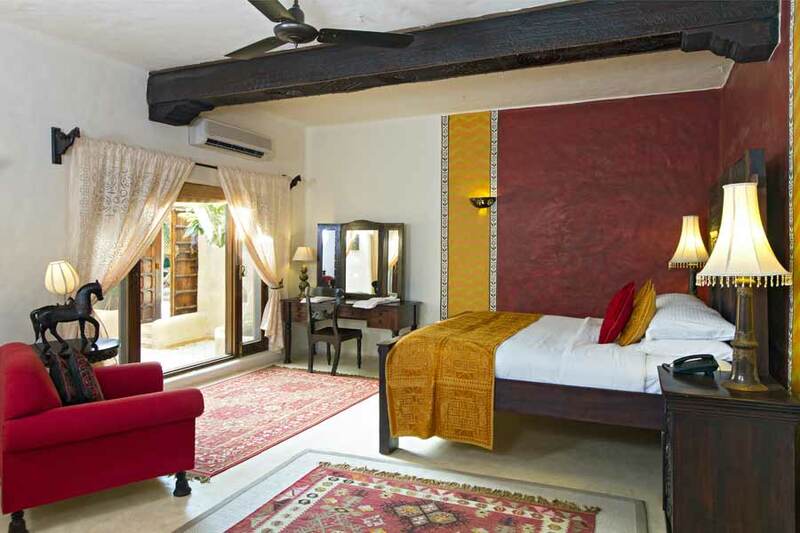 Every inch of this Heritage Fort Resort Stay at Rohat has been carefully crafted. 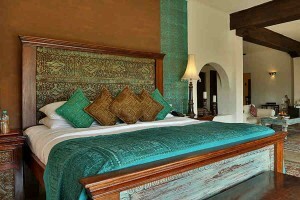 Minute nuances like color schemes and combinations have been scrutinized and laid in place to offer a kingly opulence. Gold upholstery muted walls, and wooden furniture adorns the suites here. 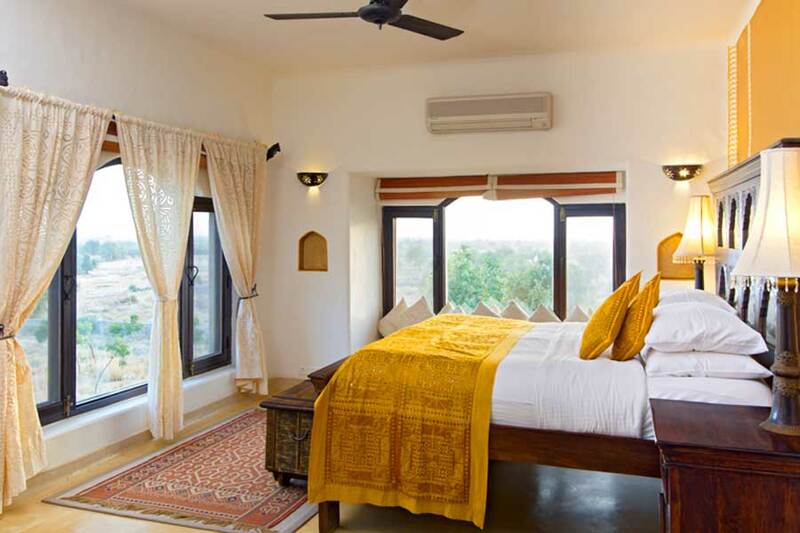 Carved horse-head curtain poles, door knobs, vast bed heads, soft yet stylish furnishings bought from the Jodhpur region, and gorgeous cupboard doors will transport you to a palatial ambiance. 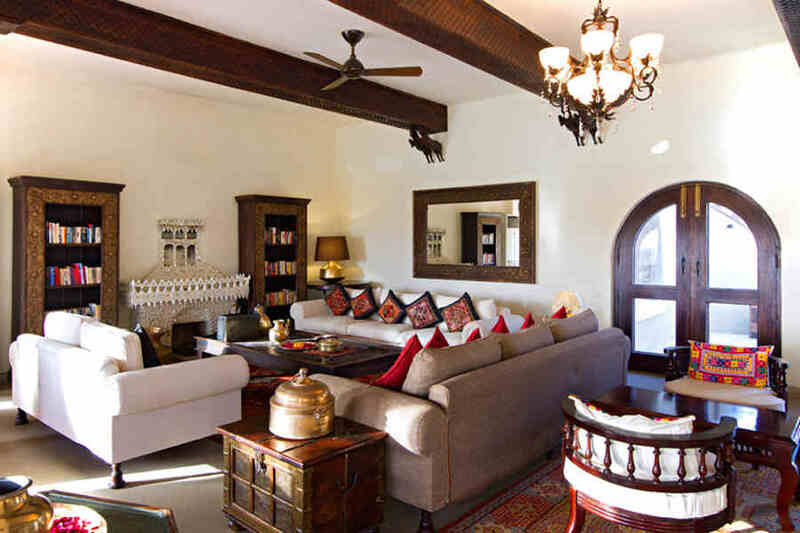 Exquisite stone chimney pieces embellished with tiny Rajasthani mirrors makes for an inviting nook to cozy up during the winter months. The rustic fireplaces have been custom made by village women using age-old techniques of the region. Rajasthani rugs enhance the beauty of the floors. No stone is unturned in the pursuit to offer you the experience of royalty alongside the comforts of modern day amenities. 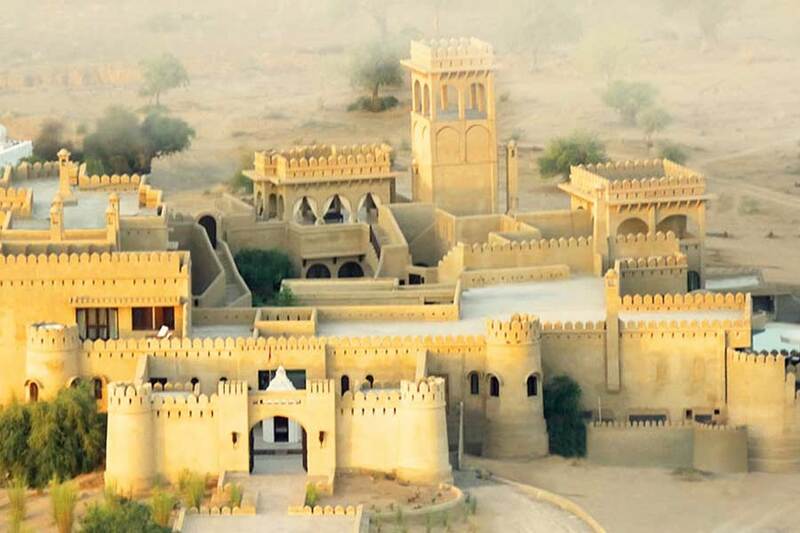 The spa at this fort resort uses Ayurvedic oils and herbs collected from the desert to give you relaxing massages and scrubs. The food served at the resort is truly regal and sumptuous, prepared using royal recipes that have been handed down generations. Continental delicacies too can be made to order. 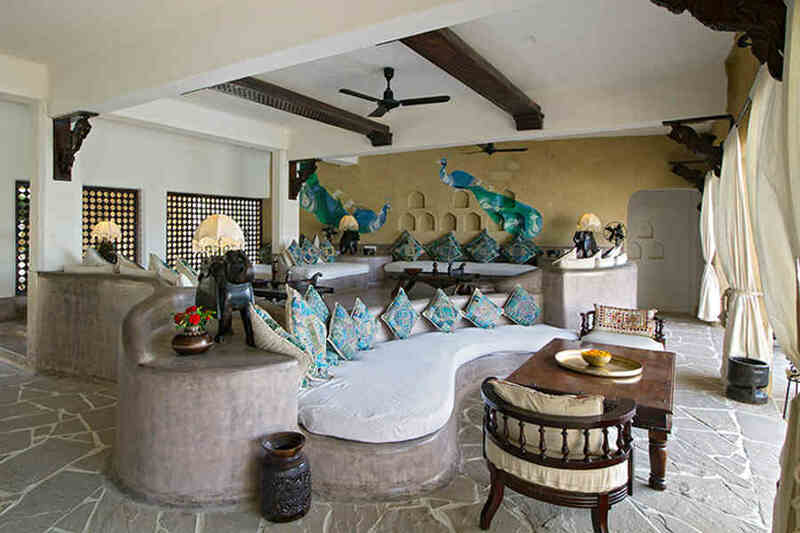 Many stunning alcoves and indulgent lounges have been designed around the fort resort and strategically placed to savor the scenic extravaganza. 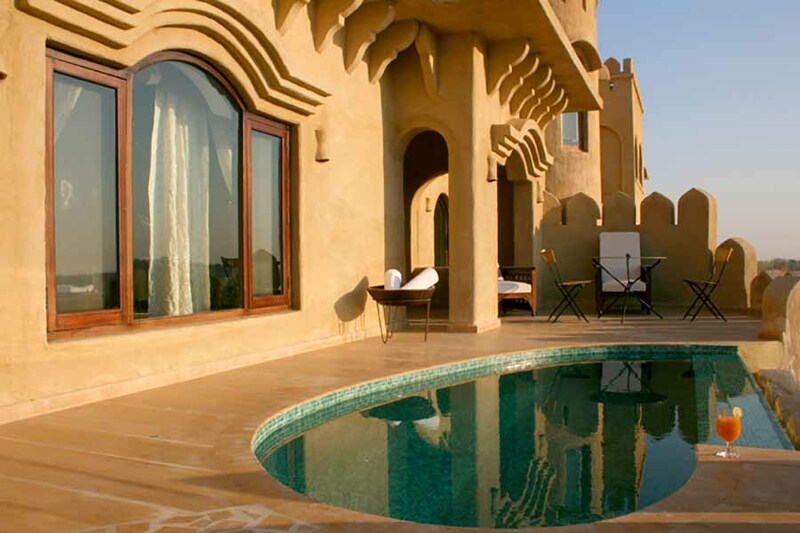 These grand seating areas offer picturesque views of the desert, the fort, and its beautifully landscaped gardens and the vast swimming pool which flows into infinity gracefully. 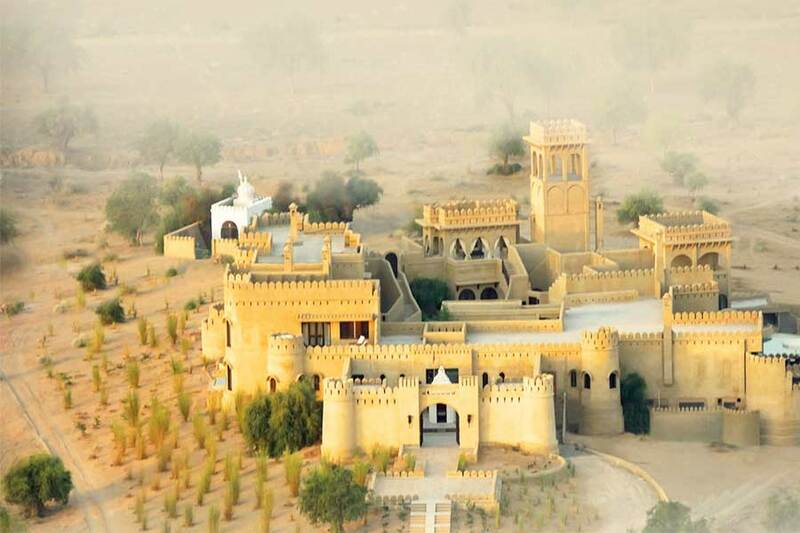 From these lounges, watch the moon rise above the majestic fort to unfold a spectacular drama. For festive dates and long weekends, rates may differ. Cancellation of booking done more than 15 days prior to the date of check-in – full amount will be refunded. Cancellation of booking done more than 7 days and less than 15 days prior to the date of check-in 70% amount would be refunded. This fort resort offers a bundle of activities that you will be thrilled with. Royal picnics which were an integral part of the life of Maharajas, are recreated for the pleasure of visitors. Camels, camel carts, and horses are available to take you to the picnic spot. Gorgeous white cabanas are set amidst the desert and a sumptuous spread of breakfast is set to the accompaniment of live music. Bread is freshly baked at the in-house bakery. T he surreal lake creates a stunning backdrop and engraves fond memories. Cooking enthusiasts are welcome to take up culinary workshops here. Attend the equestrian program and experience the liberated feeling while riding the special breed of horses from the Marwari breed. Many species of birds give you company as you ride into the unexplored wilderness. The rare black bucks have been spotted many times during these rides. The sunrise and sunset rides are the most popular ones. Guests can pick the riding programs according to their wishes. The overnight rides will be supported with fully equipped mobile camps with sanitation facilities. 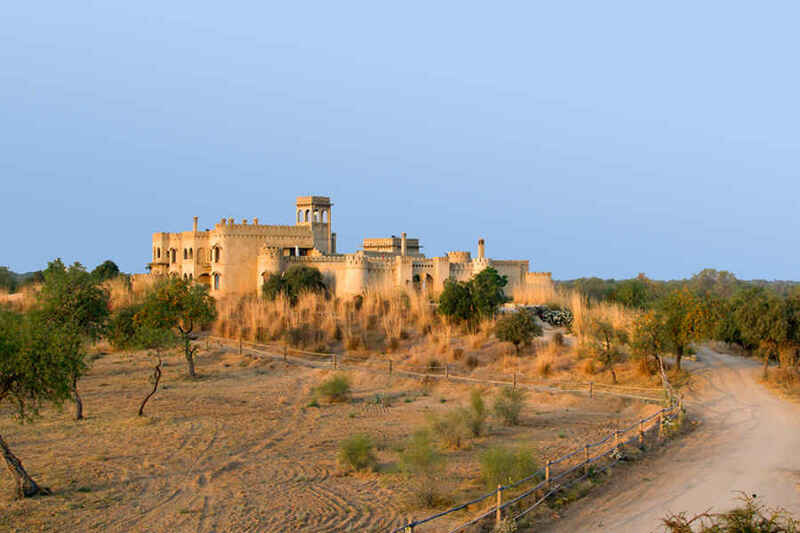 Set out on a safari to know the pulse of a Marwari village. As you explore the rich heritage of culture of the village, many mud houses, turban clad men and shy women dressed in vibrant traditional attire will great you with warmth and hospitality. Winter in the Thar Desert attracts many migratory birds. The lakes and ponds around the resort are vantage points to sight about 200 species of birds. Set out on a bicycle with a pair of binoculars, a bird book, packed breakfast, and water accompanied by a guide. Experience the Shikar dinners that the royals hosted in the wilderness after a hunting expedition. 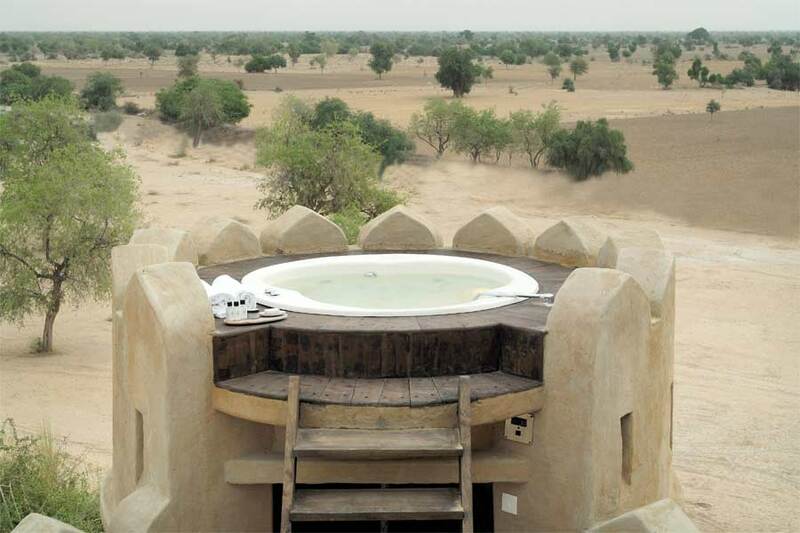 The moonlit Thar Desert is the perfect spot to recreate the seclusion and thrill of a hunters’ dinner. A fierce bonfire and soft tunes of the Rajasthani folk musicians enchant you as you savour a sumptuous dinner. As you are driven back to your accommodation on a camel cart, the sky lights up with innumerable stars. The spa here is an oasis with its long list of therapies to relax your mind and body. Chose from the wide range of reflexology, cleansing scrubs, and relaxing massages using organic and Ayurvedic products. Jodhpur is the nearest airport to Rohat and is about 48 kms (appx 1 hr) away. From Jodhpur, drive on NH62 . Drive to southward on this highway until you reach Rohat.